In advance of the holiday weekend and late in the afternoon yesterday, the Obama administration released 1,300 pages of new Obamacare regulations, adding to the more than 10,000 pages previously promulgated. This is the way we live now under the regime of the administrative state, subject to regulations dwarfing the laws duly enacted by Congress. 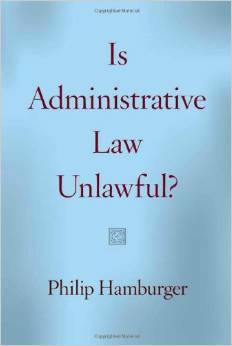 [A]dministrative governance is a sort of power that has long been understood to lack legal obligation. It is difficult to understand how laws made without representation, and adjudication made without independent judges and juries, have the obligation of law; instead, they apparently rest merely on government coercion. They therefore cannot be perpetuated on a theory of consent or acquiescence, and they traditionally would had the potential to justify revolution. Certainly when the English crown justified its absolute power as constitutional, the English and eventually the Americans engaged in revolutions against it.